If you are looking for a moderately high risk/high reward trade this week, look no further than International Business Machines (NYSE:IBM). IBM will step into the earnings confessional after the close tomorrow, and chances of a post-earnings rally are high. Before we get into the specifics of the trade, let’s take a look at potential drivers for IBM stock. The company is expected to post first-quarter earnings of $2.41 per share on revenue of $18.82 billion. There is some optimism out there for a better-than-expected report, as EarningsWhispers.com puts the whisper number at earnings of $2.42 per share. You may remember that IBM broke a six-quarter-long string of declining revenue in its last quarter. Another quarter of solid revenue growth would indicate that the company’s shift to cloud computing, data analytics, mobile technologies and security is paying off. IBM has the market clout to make this happen, and I would expect more growth in the first quarter. What’s more, IBM has become a leader in the cryptocurrency market by building out blockchain partnerships. While cryptocurrencies like Bitcoin continue to steal headlines in the crypto market, blockchain technology is where the long-term money is. What’s more, IBM has turned to one of the most respected banking countries in the world to back blockchain development, Switzerland. In fact, any guidance on blockchain development and/or continued improvement in cloud revenue should more than outshine any lingering costs of IBM’s ongoing business transition. Click to Enlarge Turning to IBM stock’s sentiment backdrop, we find considerable room for improvement. Currently, Thomson/First Call reports that only seven of the 25 analysts following IBM stock rate the shares a “buy” or better. Furthermore, the 12-month price target for IBM stock rests at $170.25 – a premium of only about 8.7% to Friday’s close. This configuration leaves ample room for upgrades and price-target increases following a positive report. IBM options traders have taken the road less traveled on IBM stock. At last check, the April put/call open interest ratio rests at a bullish 0.56. Peak call accumulations lie at the April $160 and $165 strikes, which expire this Friday. Overall, April implieds are pricing in a potential post earnings move of about 3.5% for IBM stock, which seems quite low for the shares. This places the upper bound at $162, while the lower bound rests at $151. IBM stock is currently hovering just below resistance at $160, with support near $150. A breakout above $160 following earnings could create a much larger upside move than IBM options traders are pricing in. Call Spread: For those willing to take on a bit of risk, an IBM April $160/$165 bull call spread has plenty of potential for profit. At last check, this spread was offered at $1.15, or $115 per pair of contracts. Breakeven rests at $161.15, while a maximum profit of $3.85, or $385 per pair of contracts — a potential return of 230% — is possible if IBM stock closes at or above $165 when April options expire at the end of this week. Put Sell: Alternately, troublesome tweets and a volatile market could create headwinds regardless of what IBM reports. Traders looking to bet on technical support for IBM but unwilling to be outright bullish or bearish might want to consider an April $150 put sell position. At last check, this put was bid at $1.21, or $121 per contract. As usual with a put sell, you keep the premium as long as IBM stock closes above $150 when April options expire. On the downside, if IBM trades below $150 prior to expiration, you could be assigned 100 shares for each put sold at a cost of $150 per share. 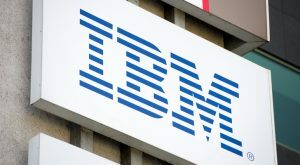 Article printed from InvestorPlace Media, https://investorplace.com/2018/04/trade-international-business-machines-ibm-stock-potential-gain/.